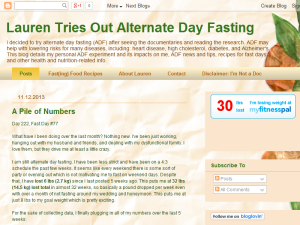 I decided to try alternate day fasting (ADF) after seeing the documentaries and reading the research. ADF may help with lowering risks for many diseases, including: heart disease, high cholesterol, diabetes, and Alzheimer's. This blog details my personal ADF experiment and its impacts on me, ADF news and tips, recipes for fast days, and other health and nutrition-related info. This what your Lauren Tries Out Alternate Day Blog Ad will look like to visitors! Of course you will want to use keywords and ad targeting to get the most out of your ad campaign! So purchase an ad space today before there all gone! If you are the owner of Lauren Tries Out Alternate Day, or someone who enjoys this blog why not upgrade it to a Featured Listing or Permanent Listing?